I have always heard that when you are a little bit down..
count your blessings and be grateful for all the things you do have! 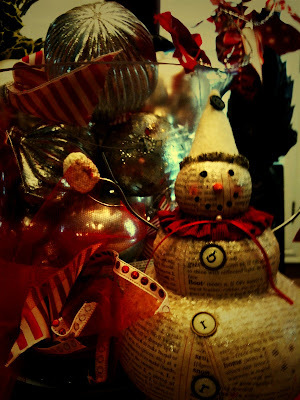 no money, shopping, decorations, fun or sun... kindof gloom after the glow of the holidays. 1. 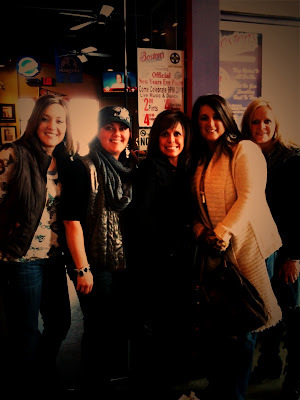 A fun weekend spent with girlfriends... we laughed and partied from afternoon till the cows came home. Thanks for all the fun girlies! 2. My laundry is almost done... I have been somewhat grounded this week- so... I have got the unmentionable chore almost done. Now if my family would just go on the "same underwear all week plan" things would be good! 3. My Man- Caylor has been travelling ALOT lately and I am pretty much over that. I like him to be home with me and his offspring. I will be glad when this traveling circus is over. The positive side of him being gone is... we can have pancakes for dinner! 4. Jessica Sprague- Wow! Anyone interested in improving their adobe photoshop skills should check her out... She is an amazing teacher... I am developing some mad skillz! 5. Diet Pepsi- Really! Where would my life be without my caffeinated motivation? 7. The Sun- I am so glad the sun was out a bit this last week. Being a St. George girl, this winter inversion kills me. I just need me some Vitamin D once and a while! 8. House of 3- Digital stuff that rocks my world! 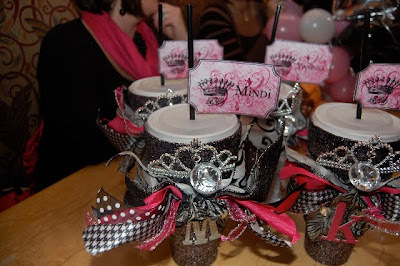 Rhonna Farrer is the designer for most of their stuff and she is A-MAY-ZING! check them out... you will be glad you did! 9. My Project 365 is mostly done... I have them all done, just a few in December still to finish up. The next thing I will have to do is to sell some plasma, hair, children, or drugs to be able to pay my Costco photo bill... It is going to be big! This has been a major project... 365 days of pictures and journaling. I thought I was really brilliant and did an individual page for EACH day in December... What was I thinking? This year I am doing 52 Simply Amazing weeks... simplify! 10. 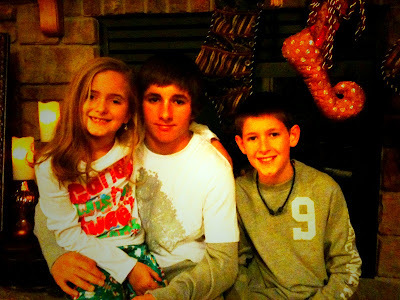 My kids- Last, but not least, I am so glad that my kids have been really good while their dad has been gone. I think I will keep them! 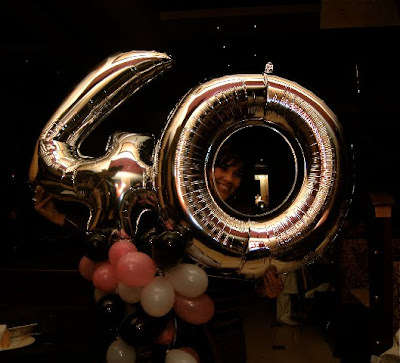 Celebrated her upcoming 40th birthday! 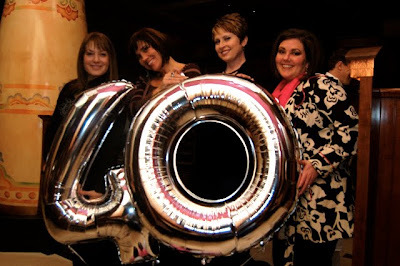 We first all met at the Cheesecake Factory only to be told there was a 2 hour wait...so we all (Mindi, Vanessa, Tiburon, Kami, Melissa, Kati, Shannon, Arianne & I ) headed to the Macaroni Grill for a little dinner and socialization... complete with balloons and glitter cups for all! Yes... 9 bloggers and no pictures! 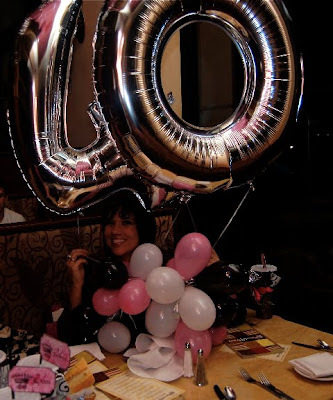 so... we loaded the balloons and glitter cups and went to Cheesecake Factory again. The good news was at 10:45 pm there isn't a wait! Kami, Mindi, Vanessa, & I sat at CF and laughed until well after closing and we got kicked out. We then continued to Mindi's hotel where we sat up and laughed for a bit later...much later! I am much to old to stay up that darn late. 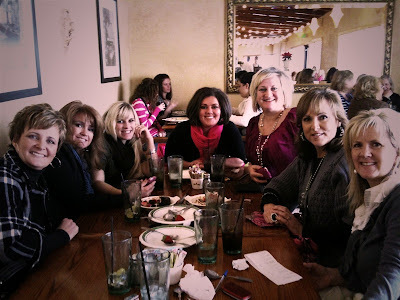 It was a great girls night out and I loved just hanging out and laughing with everyone. 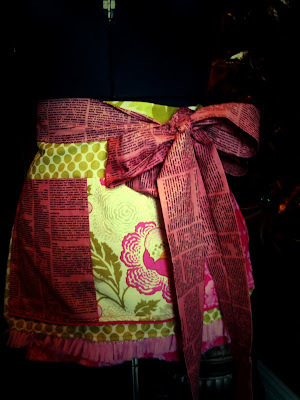 New Aprons... for the Girls Paperie! 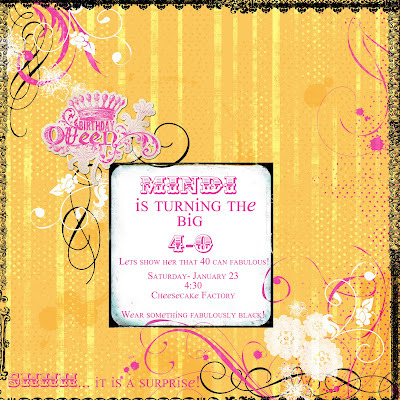 Pink newsprint is huge in her line... so it is fun that she found black and white newsprint and dyed it pink! 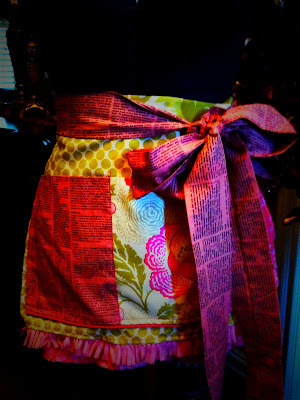 I like how it turned out... it is a utility apron... big pockets, funky fringe & pom-poms, and fun bright colors! 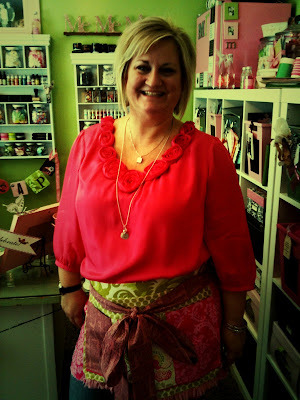 Here is Miss Margie modeling the apron... so cute! 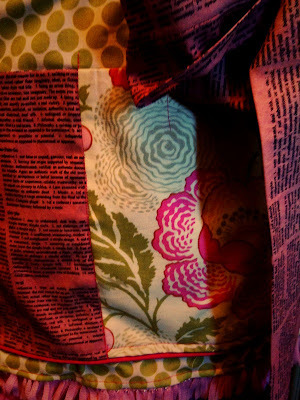 I think I might just be making a few more aprons...it was fun! Yes, you heard right Meg and I! I have decided the lodge is amazing, but it is time I hit the hill. Vancouver here I come... move over Peekaboo! 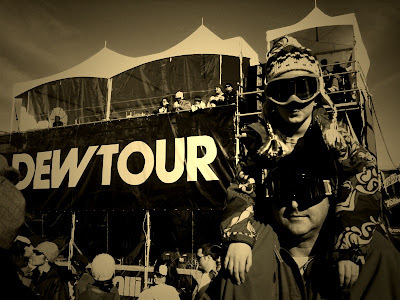 after skiing we hung around and watched the action. I was the photographer and the boys stayed home to play in the ward basketball championship so... Caylor and Meg were the models and representatives of that day. There was a little vendor fair... food stands... etc set up that we walked through. Meggie sweet talked the guys at the Verizon booth for some super cool gold Elvis shades. 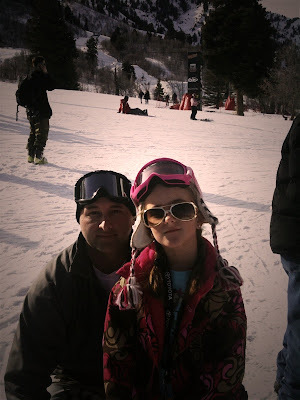 She loved seeing the tricks and just being there... She is digging the idea of being a girl snowboarder. It is all about attitude and she has plenty of that! It was such a fun day... I am old and tired and was pretty sore, but I think I am going to like being Suzie Chapstick. 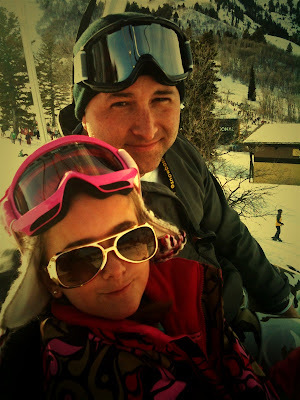 ps I got off the bunny hill and went up the BIG mountain... I am improving rapidly! But still kindof an idiot on skis! They were celebrating 20 years of Pretty Woman! It was the first time I had heard of the Red Hot Chili Peppers... Who woulda thunk it! I especially loved that her name was Vivian and his Edward... Those are my parents names. My sisters and I have used the Kit DeLuca, " Yo, Viv babe." many a time. My sister, Jody, had an outfit like it and she rocked it! I really wanted an orange linen short outfit like she wore when Kit came to visit and uttered the famous line... Cinder-freakin'-rella. And picked up a tie for Edward... then modeled it later! But the best line was, " Don't you work on commission? You wouldn't help me yesterday... Big Mistake... Huge?" After seeing this movie... I really wanted to love Opera... I really wanted the chance to attend the opera in San Francisco... in a lear jet! I almost got teary when the Roxanne song, Must of been Love, played as she is riding in the back of the limo.. going home. I had it on VHS, but well... you know how technology is... OBSOLETE! It has stood the test of time... I still LOVE IT! I heart my new Kindle! I am entering the 21st century... just a decade late. AND my new love is my KINDLE! I was hesitant at first... I love books. I love the paper, the smell, Barnes and Noble... just not the space books take up after reading. I know I could check them out at the library... but I don't. My mom and dad gave me a Kindle for Christmas... I think I am in love. I have still got to really learn all the ins and outs... but it is going to be a good thing for me. I still will go to Barnes and Noble to peruse the selection... decide... look at the covers...smell the pages. 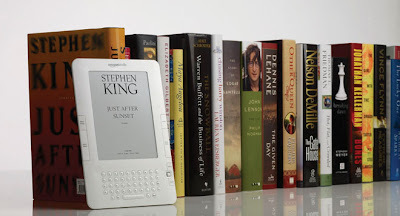 Then I will just order it right up on my KINDLE! I am already 2 and 1/2 books down... only 49 1/2 to go. p.s. If anyone has any suggestions of must reads... let me know! Meggie got baptized on January 2, we are so proud of her for her decision. 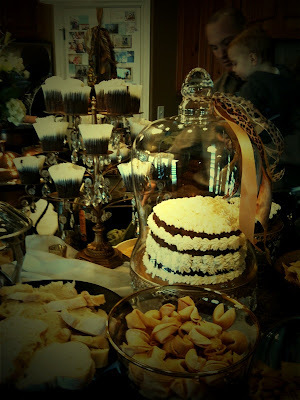 It was a great day- shared with so many family and friends. 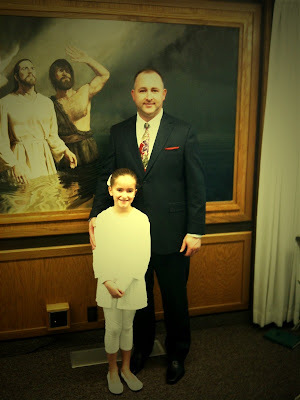 Caylor was the man that baptized and confirmed her- So proud of both of them! Sunday she got to sit on the stand and be announced in church. She couldn't believe how many people were there... she decided to sit with us after they had her stand up. 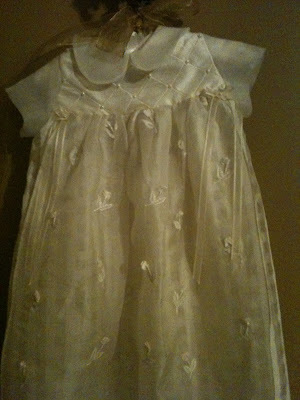 We loved her baptism dress! Grandma Viv found it in California... and it was perfect. It was the grown up version of her blessing dress. Ivory with little pearls and a lattice pattern. 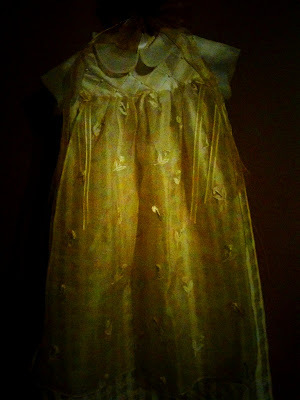 Here is her blessing dress. 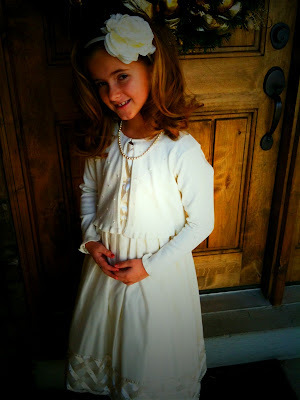 My friend Monica Rueppell owns a bridal store and I chose the fabric and her dress maker made it custom for Meggie. It is amazing! Meg took such an important step and we are so proud of her and what a special little girl she is. 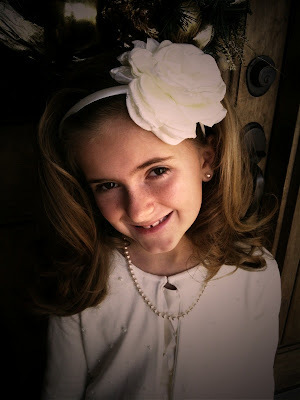 She keeps us on our toes and is a little diva, but we love her so much and are happy at the person she is becoming. All I can say is, "Watch out world!" Well... it has been a while. 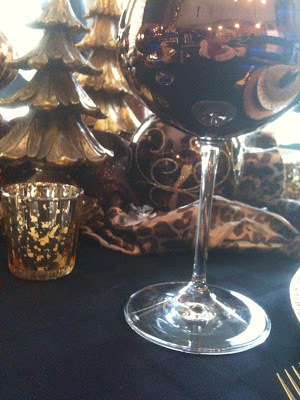 In December I threw a few little luncheons for friends, visiting teachers, etc... It was my gift to them- it was so much fun. 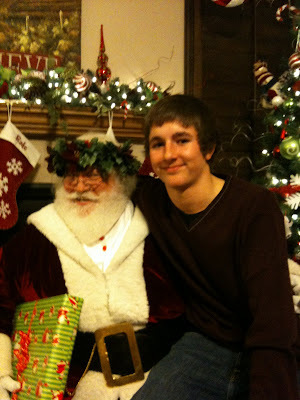 I also hosted Caylor's company Christmas party. It is always great to entertain on someone else's dime. It is a lot of work, but a really fun thing to do! Christmas morning was all that. The sleigh was once again dumped here... I think next year will be the year we cut back. It was a great day...very relaxing and then we went to Tonia & Mike Jardine's for dinner. They are such good friends... we just love them! Before Christmas we made gingerbread houses... this is one of the first years we have done it and I think it is going to be a new tradition. 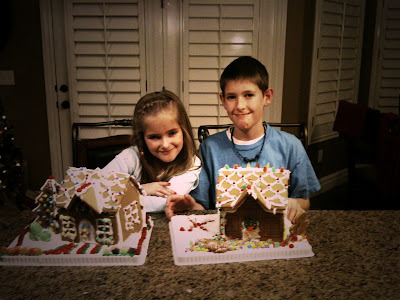 Meg's was really cute and Jackson had the gingerbread man falling off the roof with lights around his legs. I love individuality! 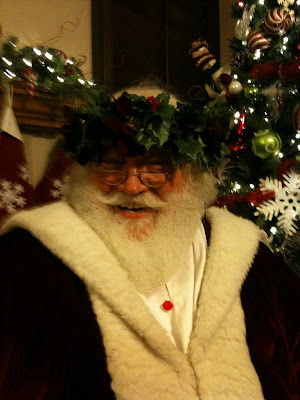 The real Santa was able to drop by and get the kids' orders. 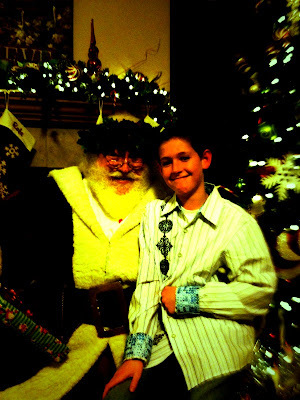 Santa stayed, had a coke, answered ANY question ANY guest had. He told the kids that he doesn't use magic... just technology that isn't known yet. He is so darling! Really makes everyone still BELIEVE! 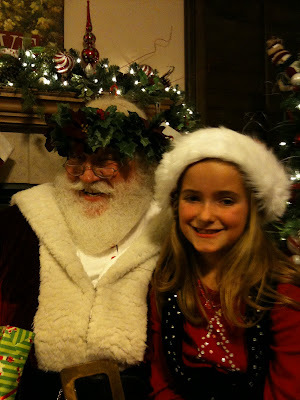 Meg was totally amazed and asked the question... "Alot of the kids in my class say that you aren't real and don't bring presents... that their mom and dad do it... what about that?" 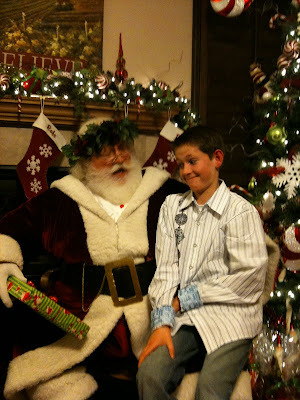 Santa's answer was perfect... he said, " They're right... if they don't believe I WON'T bring ANY presents!" 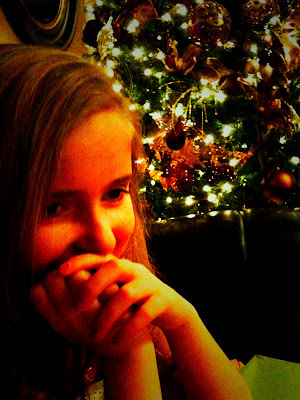 After Christmas I had a big birthday... I am desperately clinging on to the 30's.... Only 1 year left! 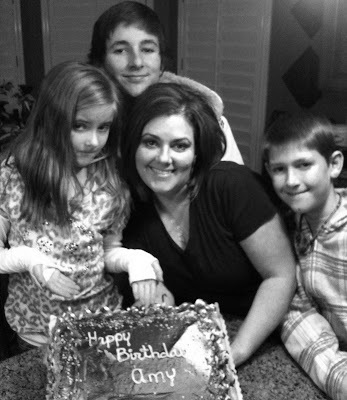 This picture was taken by Caylor the night of my birthday....we all look a little white trash! I said for my birthday all I wanted was Zeponie pizza and to be able to go in and work on finishing my project 365 UNINTERRUPTED! And that was what I got.. it was so nice to not have to referee or even listend to what was going on at my house. And... I got so much work done... it was a great day! 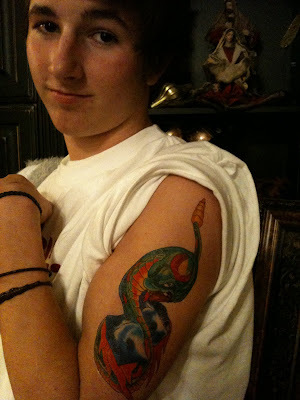 Mitch got a tattoo in honor of my birthday. He is such a great kid! Thank goodness it was just a pretend one... what is going to happen when the pretend ones don't cut it anymore? On my actual birthday I had lunch with my neighborhood friends... such a great time! 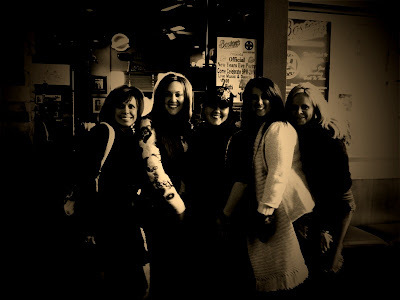 The day after I got to celebrate AGAIN with Tonia and the Syracuse babes! We had lunch and then saw the movie NINE! 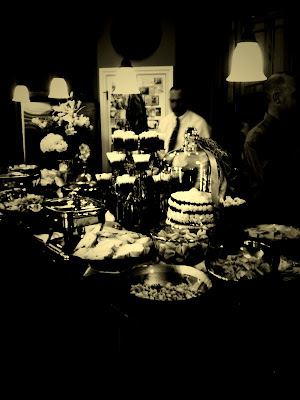 Great food, company, & entertainment... who could ask for anything more? Then... Viv & Ted and Brandy & Ryan all travelled up for Meg's baptism. 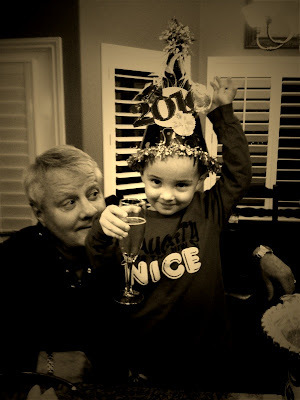 We believe in starting young... Jace, my nephew, is 3 and was jazzed to drink "CHAMPWAYNE"! 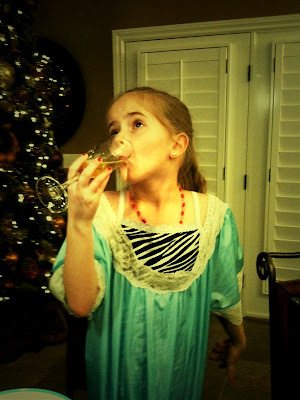 Meg is in a strange get-up doing the dramatic drink pose. 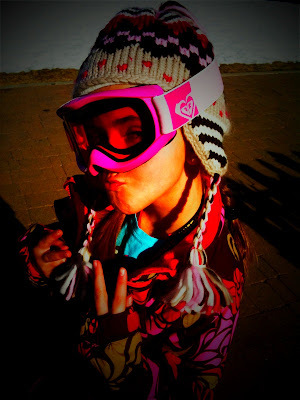 She is a little diva! 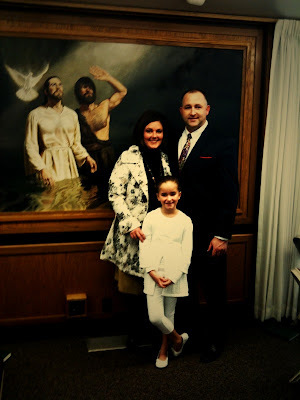 On January 2nd Meggie got baptized. Alot of our family was here... my parents and sister, Caylor's parents and brother, friends, neighbors... it was a really great day! 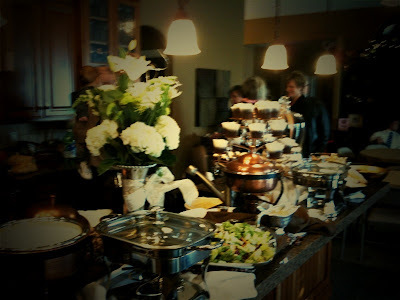 We had a great party... lots of food, friends, family, and fun! 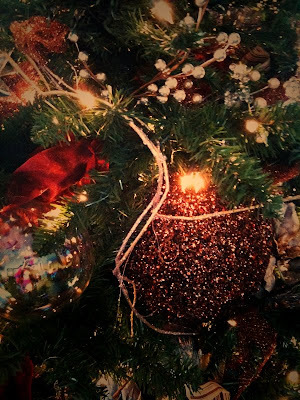 Monday the Christmas dream had to end and we all had to return to the real world. Meg wore a cute new outfit she got for Christmas. 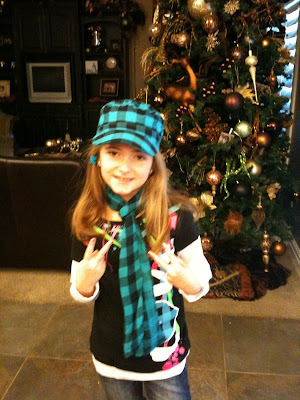 She wanted me to write a note to her teacher telling her that Meg needed to be able to wear her hat all day at school. I think she wanted me to cite the reason as a fashion emergency. I didn't write the note, but I think she looked so dang cute nobody made her take off her hat the entire day. See fashion can bring people together... it was a fashion emergency! With the kids back in school I had no choice but to take down all the Christmas decorations. 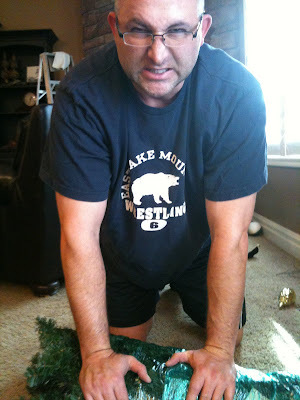 This is kindof a weird picture of Caylor wrapping one of my Christmas tree pieces. Needless to say he doesn't love putting up OR taking down the tree. I am happy to be back...see you soon!